Above shows the coil as rebuilt in 2007. 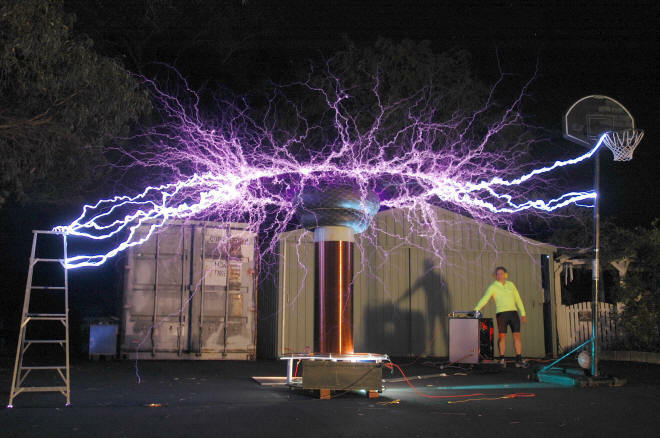 See more sparks here on the sparks page. But first let us go back to 2005 and "first light". Above shows sparks from a hasty lash up. The primary is thin 19G wire taped onto a flattened cardboard box on a wooden pallet. The topload is a toroid with a sphere, with a breakout point, sitting on top. The coupling was all wrong, the tuning very brief (11 turns) and everything was wet with dew. My ARSG gap was not optimised. 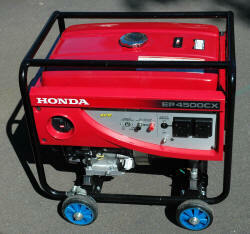 The current draw was over 20 A (5KVA). Still the 5 foot sparks were gratifying and limited by the proximity to the basketball ring. Neither the Tesla coil or basketball ring were easily moved to get a peak spark length. 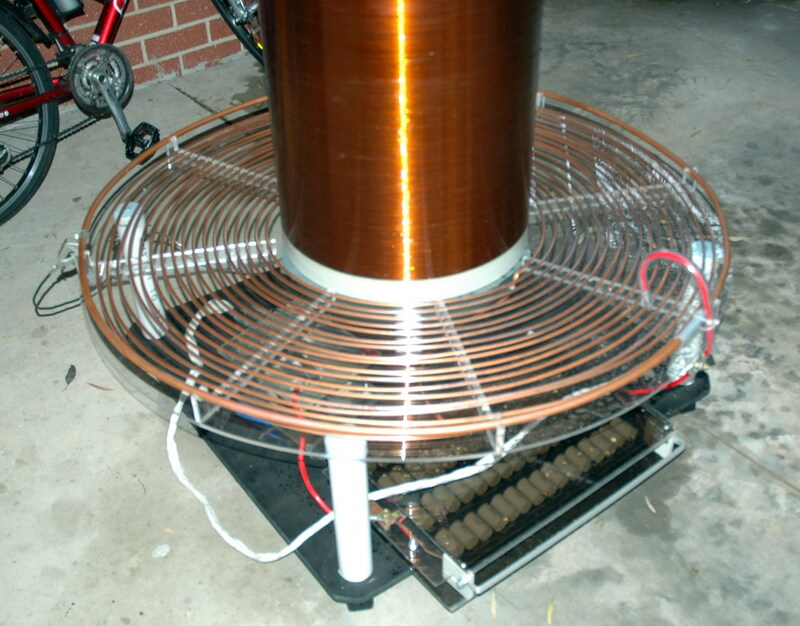 There were some problems and the current draw did not 'feel' like a high inductance coil. 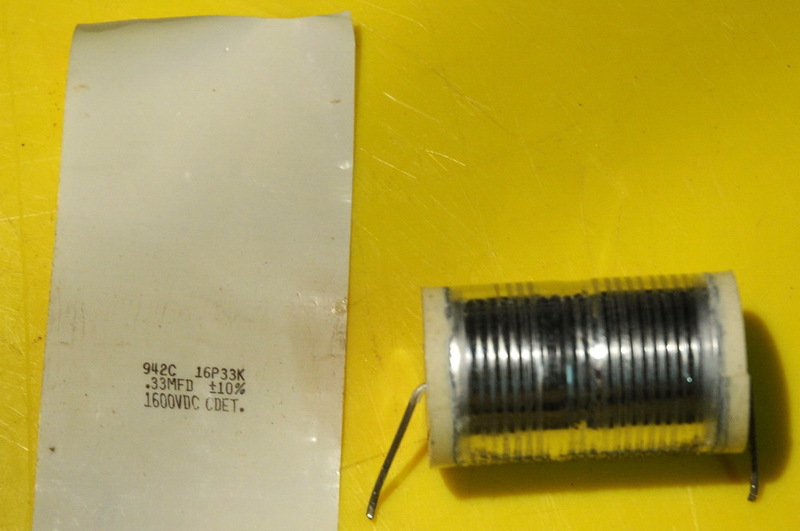 This may simply be a reflection of the larger capacitor used. The power would tend to fade at intermediate power but not at high power. The spherical electrode makes this look like a scaled down Electrum. Secondary former. The former is made of 3 mm (0.12 inch) polypropylene sheet welded around end caps and one centre cap. 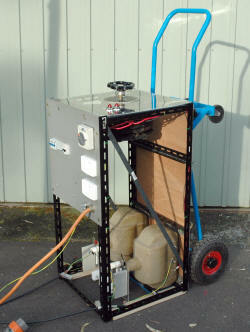 This is light (weighs 9 Kg, 20 lbs) and the polypropylene is a suitable plastic in regard to dielectric losses. It measures 45 x 150 cm (18 by 59 inches) and cost AUD$250 to be made up by my local plastics shop. 1240 turns of 0.9 mm(19 AWG 0.037 inch) wire on 45 x 128 cm (18 x 50.5 inches) elevated 15 cm (6 inches). 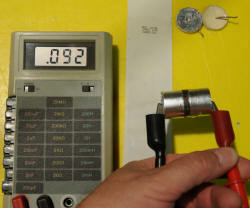 I have used 11 kg (24 lbs) of C 220 (220 deg C) polyimide coated enameled wire. This is 5840 feet = 1.1 miles or 1.78 km. Wire with 200 deg C rating was suggested by Dr Resonance. See other comparative wire ratings. Cost was AUD$ 165. 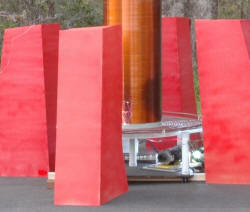 I have used a geared down motor and a latex belt to drive the rotation for winding. That's 7 seconds per turn at 1200 turns = 3 hours in theory. Unfortunately, I have been beset by Murphy's Law. Winding was interrupted when only 1/3 complete, by rain and gale force winds. The following day the windings had loosened and overlapped, possibly due to compression of the rather thin polypropylene former. I unwound the few hundred meters and started again. This time the winding belt broke so family were called out to provide the rotation. Then the wire ran out about 4 inches short of the end. Either my calculations were out or the wire was less than the specified 11 kg. I am not happy about the smoothness of some of the turns as well but will have to wait and see. I gave several coats of polyurethane (total 1 litre) to fix the windings. 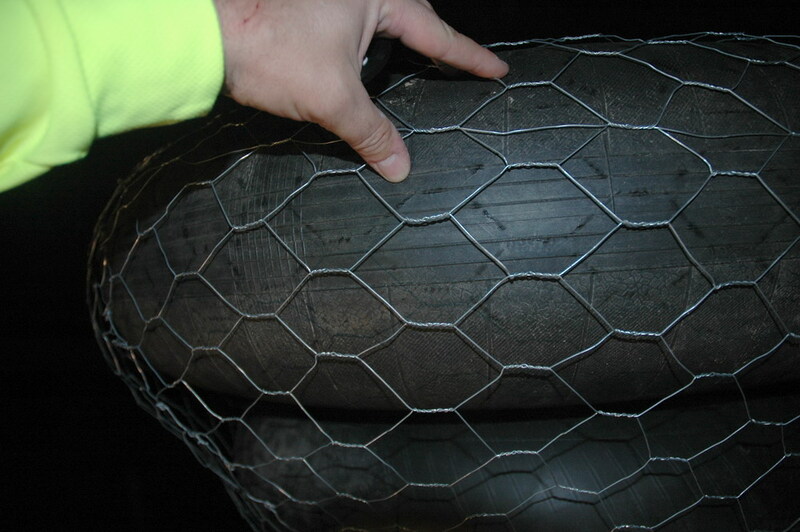 In 2007 a stray wire cause sparking to the secondary (upper left photo above) caused shorting in 3 places. The upper middle photo shows the lower short vaporized a short segment of wire. I removed 2 turns in 3 places, recoated with polyurethane. This time my motor setup in the upper right photo was more reliable with the motor rotating things for about 24 h and it runs fine despite looking a bit scrappy. 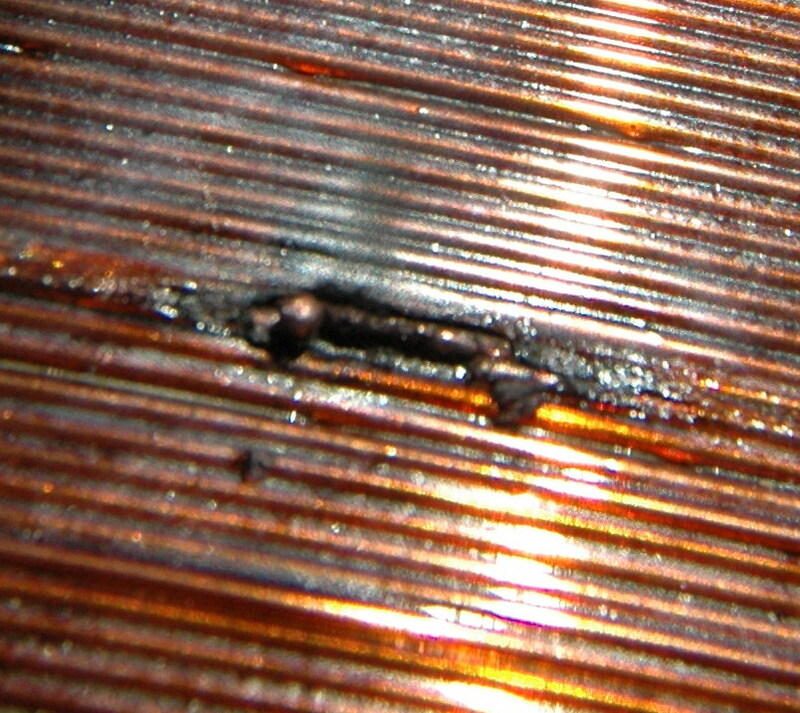 The lower photo shows the coil running again. It is a 6 second single exposure. The flash goes off to highlight me, then in darkness I go and turn the TC on briefly. I am never anywhere near sparks in reality. Primary flat spiral fairly broad of 6.35 mm (1/4 inch) copper pipe 12.5 mm (1/2 inch) spaced. The initial lashup was to determine the tuning range. 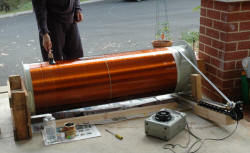 Toroid I initially used a truck inner tube of 9 x 33 inches covered with aluminium tape. Of course in keeping with Murphy's Law (above) I found a puncture half way through taping the tube requiring hasty patching. Cross fingers and hope. It stayed inflated for 2 years until I tried to inflate it a little more then the hole became permanent despite using tyre inflate and seal latex pressure pack. 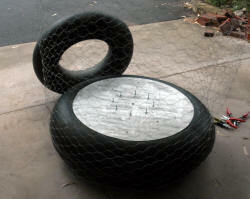 Later I used a double toroid covered with chicken wire. This seemed elegant, light and rugged. Also had good central support for a rotating breakout point. Alas after a full power run it appears that corona had eaten into the tube and created numerous holes (although the wire framework was intact). The left photo shows the double toroid construction. The middle photo shows the toroid in situ. The right photo shows the holes from the corona. 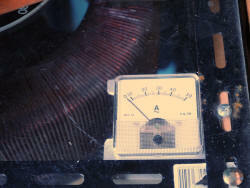 Synchronous rotary spark gap (SRSG) 100 breaks per second (below). I have modified a 1/8 HP 2850 RPM 50 Hz motor for true synchronous operation at 3000 RPM = 100 bps for 2 electrodes. This was done by milling two flats in the rotor to a total of 30 % of the circumference with an angle grinder. 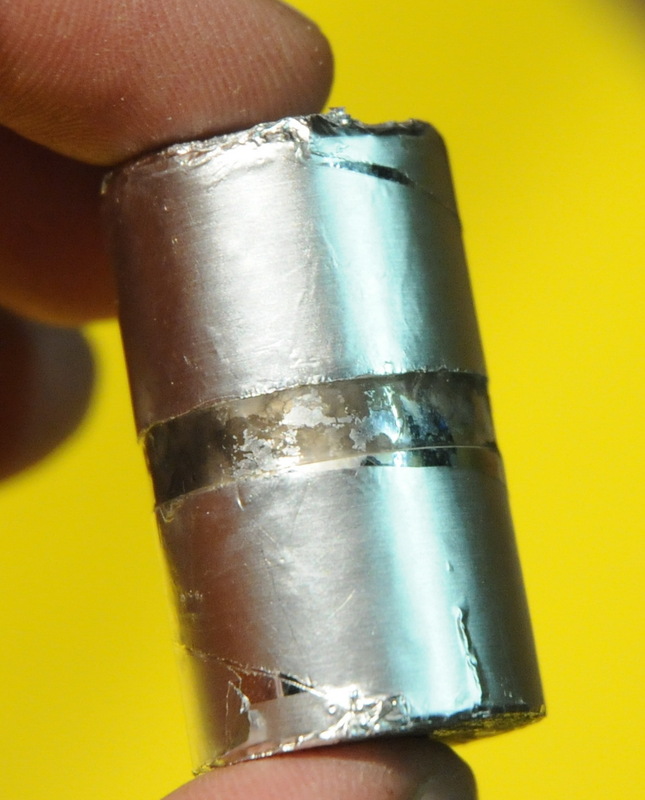 For motors of half that speed you will need to grind 4 flats to a total of 40% of the circumference. 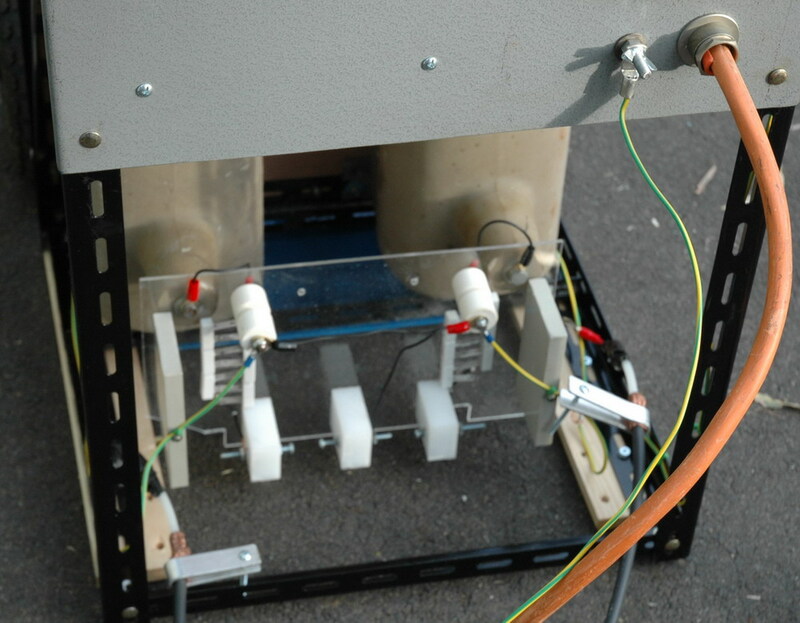 A synchronous motor is the most efficient way to discharge the tank capacitor as it discharges when it reaches full charge at each peak in the mains 50 Hz cycle which is 100 beats per second (BPS). The synchronous rotation is visible under fluorescent or incandescent light if there is a white mark on the disk. More accurately I use my high intensity Luxeon Star white LED run off half wave rectified DC adjusted so it only just turns on at the peak voltage. I will also use the ARSG as well to compare. This motor is a bit small but probably is OK for my current disc size but might not be for a larger one. The middle photo above shows the spark gap connected to the MOT supply without a capacitor. The power arc extends almost around to the other contact. 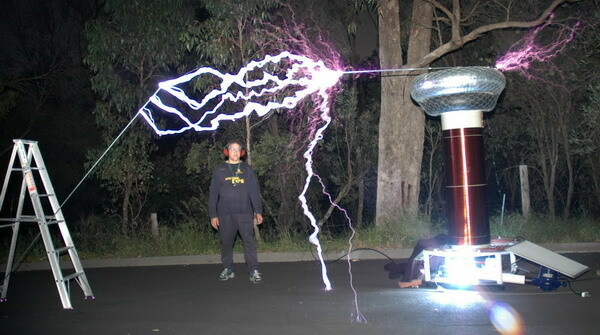 The last shot is with the normal Tesla coil setup with the capacitor discharge giving an intense spark. I planned to use a phase controller by John Freau. As it turned out though I never ended up using this system as a synchronous motor. I ended up using my ARSG driven by an angle grinder. Performance was poor probably due to poor quenching so I used a series static gap with a leaf blower which improved things a lot. 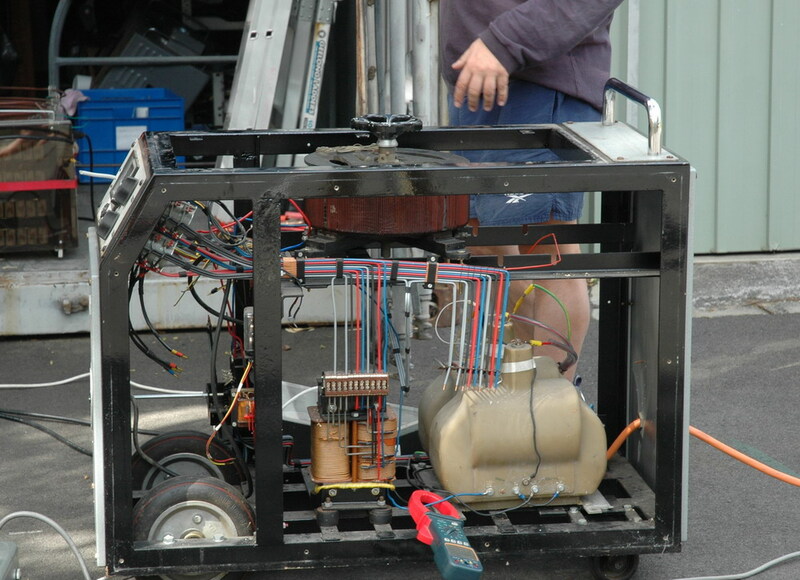 Later (2007) I did use this motor running 8 electrodes at a relatively slow rate driven by 80 instead of 240 V. Still had to use the series quench gap though. 0.09 uF MMC (4 rows of 15 times 0.33 uF 1600 V Type CD 942C 16P33K). In 2011 I had my first failure of one of these caps. Interestingly it failed open circuit and with no capacitance. This was bizarre and suggested that the cap lead had come disconnected. The resistors had blown and had been sparking across. Autopsy revealed that that the foil bridge was completely lost. The ends were intact. This is a mode of failure I have not heard of. 0.1 uF MMC (3 rows of 20 times 0.68 uF 1600 V Type CD 941C 20P68K). 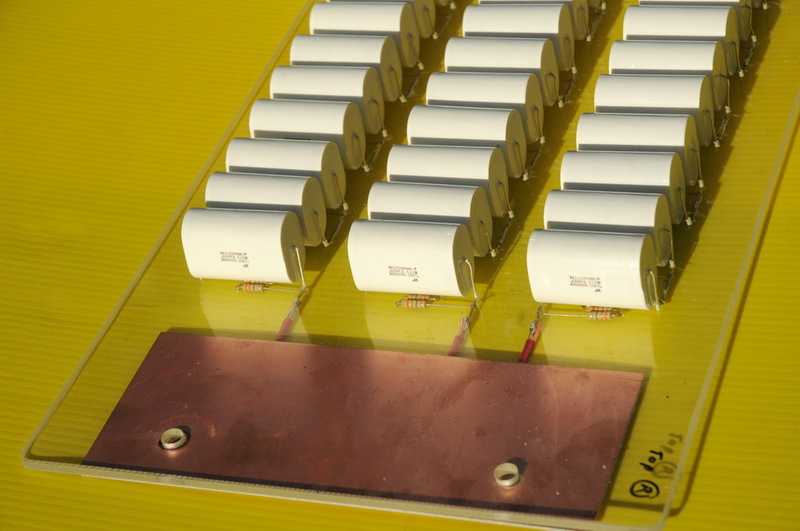 This is the upgraded capacitor bank using the 941 series caps rather than the Tesla coiler preferred 942 series. 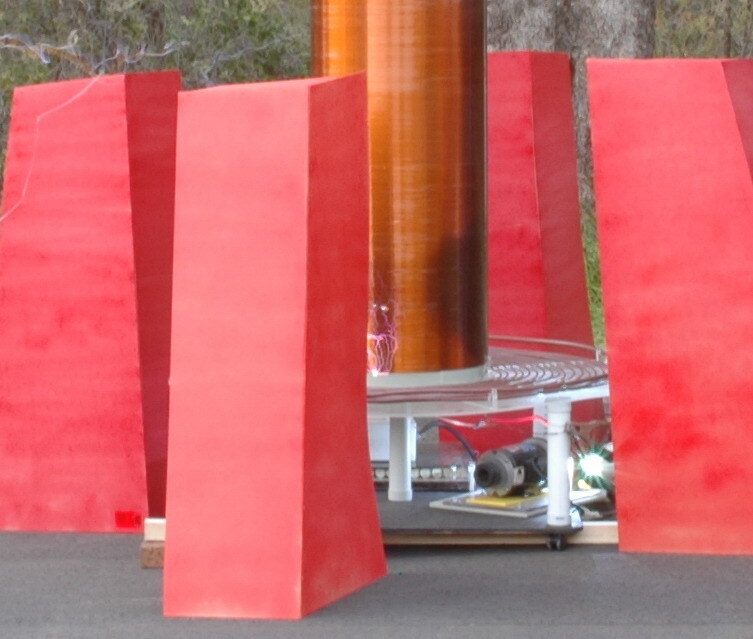 It has much better voltage characteristics 40 kV vs 24 kV DC. RMS current rating is similar but adequate. 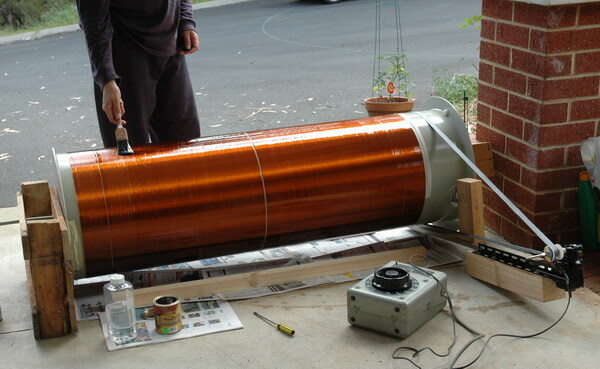 The dV/dt is less but this is a low frequency coil so that might not be as important. The much bigger capacitance means only 60 caps rather than 240 for the 942 series. I have enough to make a spare. For power I have a dedicated 250 V 32 A line. 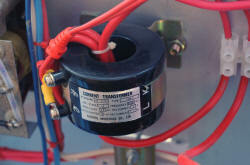 I have two HV transformers (?potential transformers) rated at 10 kV each. These are fairly solid epoxy coated types and have 100 V and 50 V inputs each. Put in series they give 300 V in for 20 kV out. So perhaps 16.6 kV at 250 V. I don't know the ratings which is a worry particularly when one rating is only 30 VA. Hopefully this is the load that still gives accurate voltage division only. The variac is a 250 V 20 A one from a old motor driven voltage regulator ex physics dept. All this goes into a trolley that was originally the base for a 8 kVA Xenon arc photocoagulator. 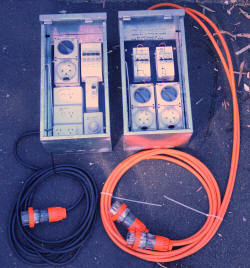 It has lots of 3 phase stuff in it much of which I have removed. Still rather unfinished. Unfortunately this setup was like a tank to shift and there seemed no hope to be able to easily get it on to a trailer unaided. I therefore rebuilt it into a lighter shell. So, here is the new one. This is much more transportable and ergonomic and with a smaller footprint. It is not too hard to get this up a trailer ramp with one person. Still needs a lot of work such as current and voltage metering, fans and panels. I have lots of things I could put in here like ballast coils and a 3 phase generator. There is a 50 A rated dual phi filter to help prevent mains interference. 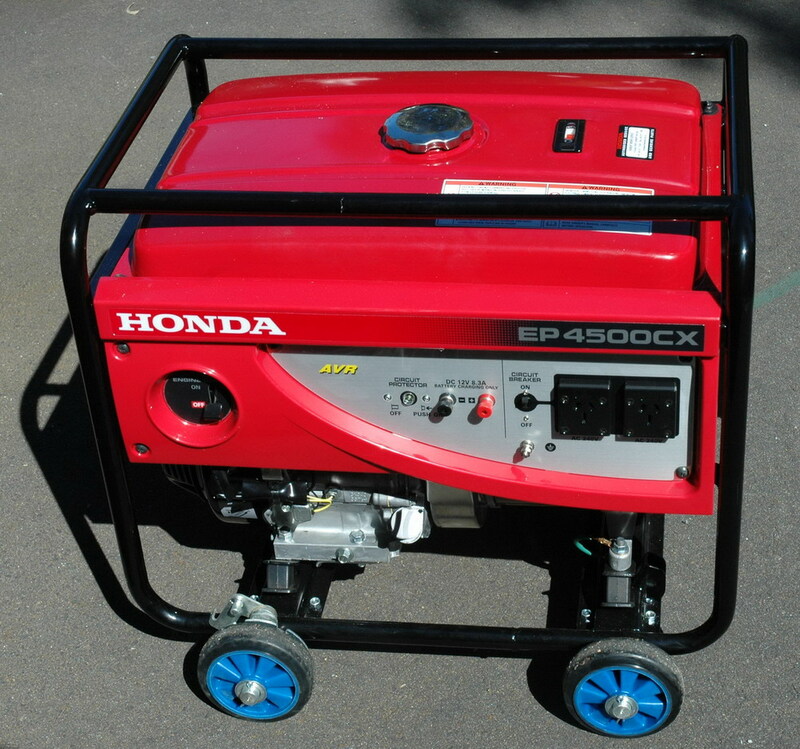 I now have a 4.5 KVA generator which will give me some portability to my Tesla stuff. It will give up to 7 foot sparks when used alone with the big TC. 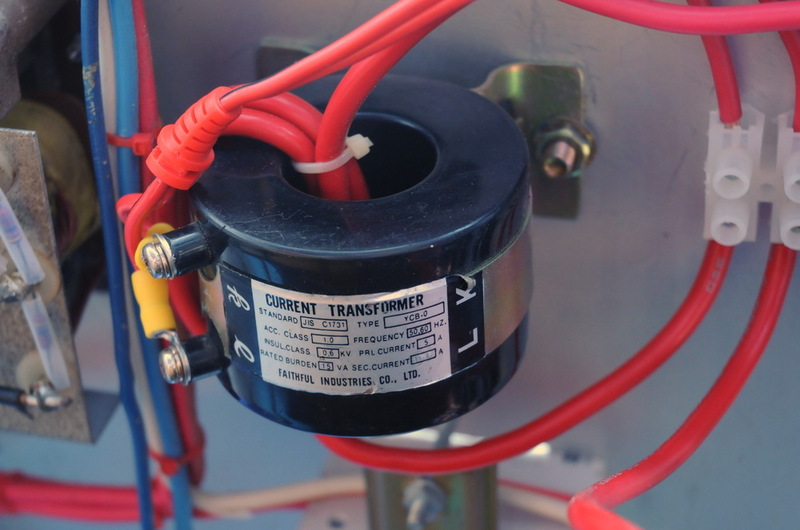 For monitoring current input, I have used a current transformer rated at 150 A driving a 5 A moving iron meter. To get a 50 A full scale I have run 3 turns of the power lead through the current transformer. 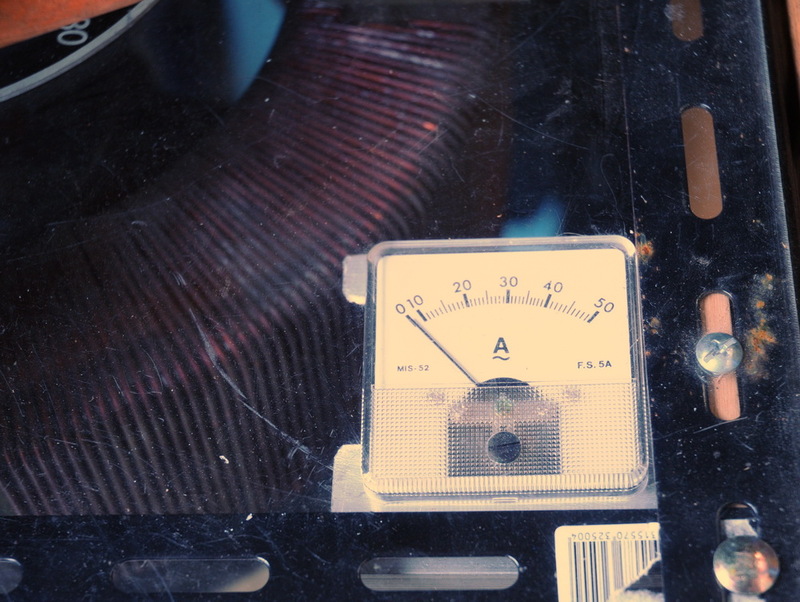 This still reads a bit high in use compared to a clamp meter with an analog scale. The problem is that it is not a sine wave being measured but rather an ugly chopped up waveform. It has become important this year as I will be using a different outlet at a venue and don't want to exceed the ratings and trip a breaker. And my current draw on full power? 75 A = 18 kW. I plan to run this off a 3 phase outlet 415 V 32 A. Each phase has 32 A available to neutral. I will have a distribution board made up and an isolation transformer to limit the likelihood of transients getting through. 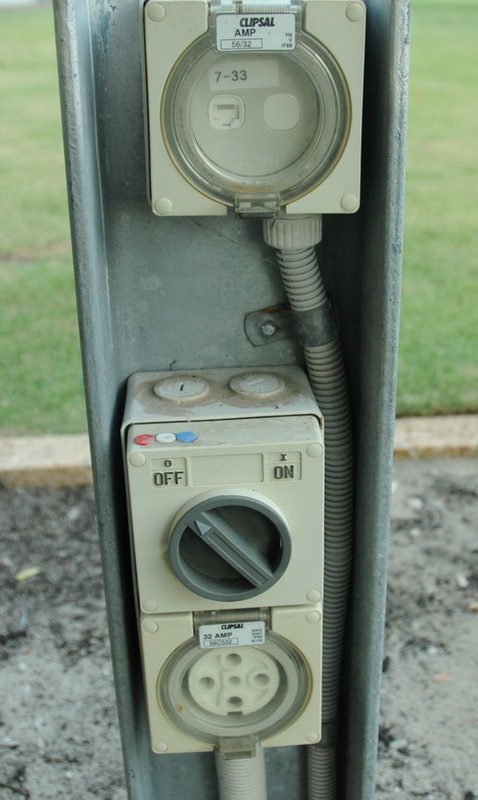 The left photo shows a typical Australian 3 phase 250 V 32 A socket in an outdoor setting with computer cabling as well at the Perth Convention and Entertainment Center. The left photo show the two distribution boxes I had made up. 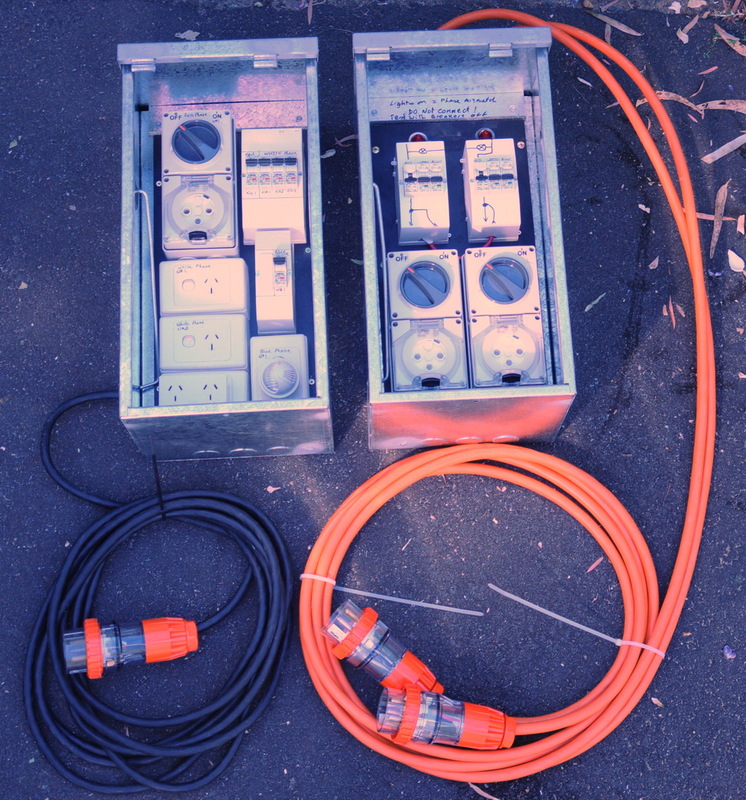 The box with the black cable is 3 phase to a 250V 32 A single phase (red) and the other phases (white and blue) go to standard domestic sockets rated at 10 A. 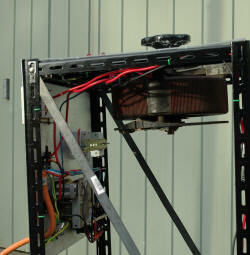 The orange cable box is a bit trickier. I have wired two 3 phase sockets in with the red phases in parallel to theoretically give 32 A + 32 A ie 64 A from 2 sockets. Remember the 18 inch coil runs 75A but will be OK for short runs on a 64A line. There is a pilot light system which lights up if the phases are wired incorrectly before the lines are paralleled. This worked fine recently at the Australia's Got Talent show. 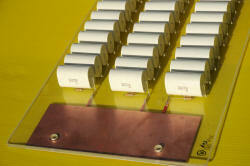 I have obtained a variety of IGBT's the largest of which are 3 Powerex IGBT Modules (half-bridge config) CM300DY-24H. (Thanks Dave Trimmel). 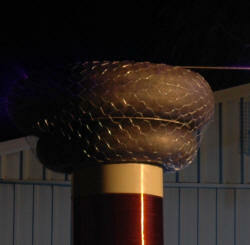 These are rated at 1200V 600A and are suitable for a DRSSTC (double resonant solid state Tesla coil) or an SISG.